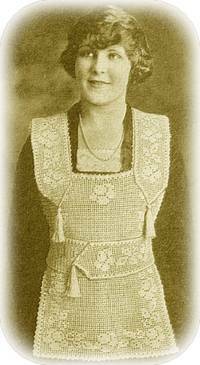 Blouses like this border rose filet crochet pattern were popular in the 1920’s. This one comes with a matching Border Rose Bag; both patterns were designed by Francis Harris, and published by Clark’s O.N.T. Designs. 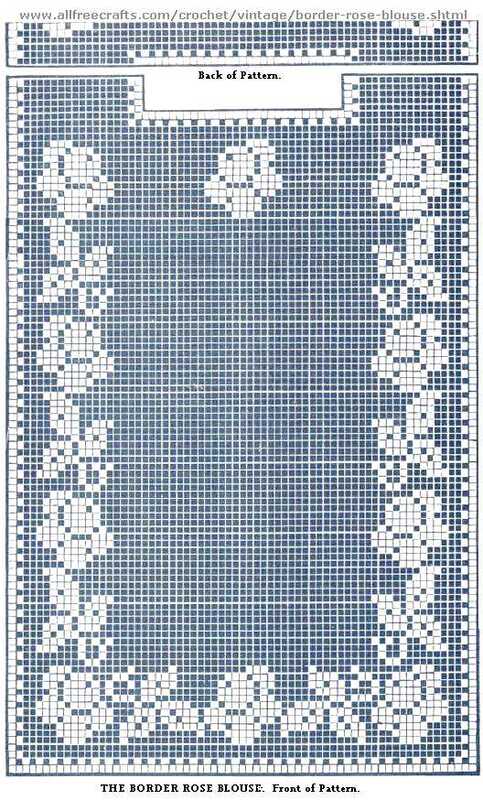 Please see Harris Crochet Stitches for details of the stitches used in this pattern. This is the handsomest blouse design yet offered to the usrs of Clark’s O. N. T. Cottons. It is simple, to the extreme, yet quite rich in its effect. The model was made with Clark’s O. N. T. Mercerized Crochet, 10 balls of ecru, size 10 for the body and 3 balls of Royal Blue, size 30, for the shoulder pieces, belt and tassels. Use Clark’s O. N. T. Crochet Needle, Size 10. Begin with a chain of 204, skip the first three ch for a tr, then work 201 more tr across row. Row 2. Blk, *sp, blk, across row. Follow the pattern until the neck edge is reached, then work each shoulder to about nine inches long. After the shoulders are of a sufficient length, add a chain of 86 to form the back of the neck and proceed with the design as shown at the top of the pattern, omitting the rose in center and reversing the pattern of the front. The shoulder straps are pointed at each end and have three roses and two leaves. The belt is square at one end and pointed at the other, of proper length to nicely encircle the waist. Close the belt with snap fasteners, and repeat 3 single crochet and a picot, around edges. Make five heavy tassels, each 3½ or 4 inches long and attach one to each end of both straps and to the tip of the belt. Excerpted from Clark’s O.N.T. Designs for Blouses, Scarfs and Bags, available as a free PDF download from the Antique Pattern Library, under Creative Commons License 2.5.